The 200-hp Scion FR-S has a top speed of 142 mph. Production begins in the spring. OYAMA, Japan -- Toyota President Akio Toyoda is hoping a 200-hp rear-wheel-drive sporty car branded as a Scion can spice up the Toyota brand. The Scion FR-S, unveiled at a Formula One track before the Tokyo Motor Show, has been in the works for five years as a joint project with Fuji Heavy Industries Ltd., which makes Subarus. Production of the car begins in the spring. -- A price low enough to attract recent college graduates. -- Sporty handling and a low center of gravity. -- No fancy electronic control systems or turbochargers. -- A ride that can be customized and tuned easily by car buffs. Toyota hasn't disclosed a price or fuel economy estimates. But the company has said it is targeting a sticker in Japan of around ¥2 million, or about $25,700. Tada said designers want to design a vehicle controlled by the driver, not by computer chips. "A lot of cars these days are controlled by computer chips, and that leads to a sense of the car driving you, instead of you driving the car," he said. "We decided to use as few computer controls as possible. We wanted to go back to basics." The FR-S's sister car is the Subaru BRZ. Toyota did the styling, while Subaru provided the four-cylinder engine. Subaru will build both versions in Japan. Toyoda, a racing fanatic, checked in monthly on the car's development. He often test drove the FR-S and gave orders on what to fix. The FR-S gets a 2.0-liter four cylinder, DOHC boxer engine from Subaru equipped with Toyota's D-4S fuel injection system. It comes teamed with either a six-speed manual or six-speed automatic transmission. The fuel injection system has twin injectors for both direct and port injection. The interior styling is a no-frills, utilitarian look with old-school dials and switches. Some paneling is simply shiny black plastic, while other trim gets a faux carbon fiber texture. The steering wheel is the smallest in the Toyota lineup, with a 14-inch diameter to provide optimal steering performance and grip. The FR-S seats four -- with very cramped rear leg room. But the back seats fold down to provide space for luggage. The FR-S first appeared as the FT-86 concept at the 2009 Tokyo Motor Show. In Japan, the production version drops the "FT," nomenclature for concepts that means "Future Toyota," and will be known simply as the 86, a nod to the popular AE86 line of Corolla-based sports cars of the 1980s. 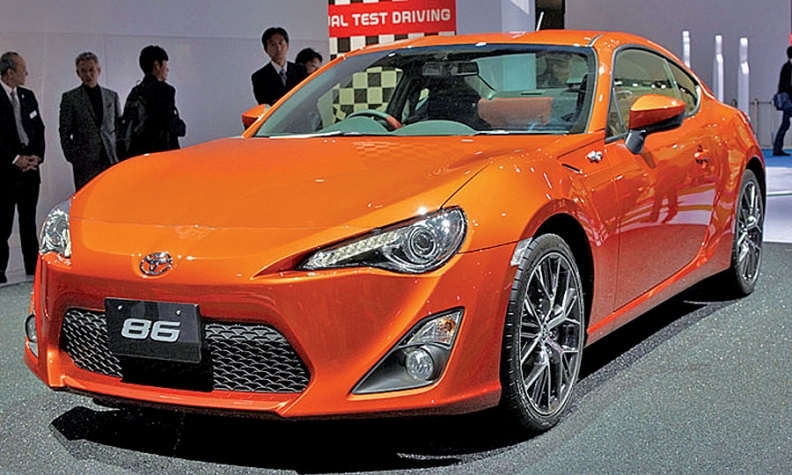 In Europe, the car will be sold as the Toyota GT 86.